Once we approach Burnley station, there is a shift from tagging to more mural like artwork. One piece just after the Burnley station is a massive piece on the walls of Eco Timber. It appears to be layered-many artists have added to or gone over the original piece. The most striking feature is the large dog. I love that the different layers encompass different street art styles such as tagging and realist artwork. To pinpoint a reason for the sudden shift in the dominant form of street artwork is hard. As we approach the station, tagging is still prominent but we also see more realist works. The blank wall provides the artist with the opportunity to abandon the canvas and create something that interacts with the environment. 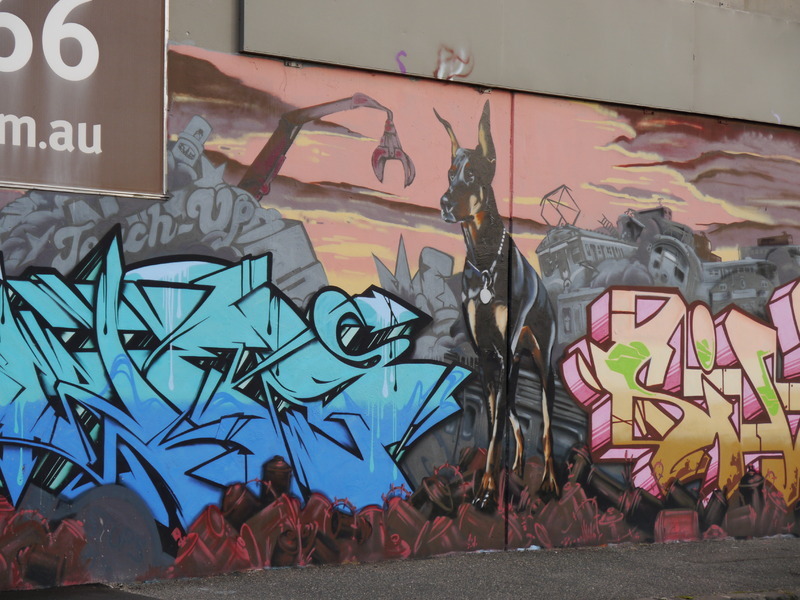 “Stop 3: Burnley,” Street Art deTours, accessed April 20, 2019, http://streetartdetours.com/document/1018.